I won’t try to pretend to have an educated view on art ( my university degrees are in banking & journalism )but I love going to art exhibitions and learning something new about the world, the artist and the perception that art gives us. For me, it’s not about the artist being well-known or being heralded by the press and art critics, it’s to do with the artist moving your soul, bringing some kind of emotion ( hopefully positive, rather than negative ) to the surface & giving you pause for reflection. A few years ago I saw the most beautiful paintings by the artist called Jessica Zoob at Medici Gallery in Central London. The paintings were as dramatic, as they were colourful and the memory of them continues to linger. Then one day last September, an interior designer friend of mine Davina Merola ( Space Alchemy Interior Design LTD ) mentioned Jessica’ exhibition ‘Private View’ at Albion Riverside, run by Loughran Gallery ( the gallery itself might be fairly young but it has a dynamic team that surprises with the ever rotating venues and fascinating art edit ). ‘Jessica’s paintings can fuse happy & sad events and create new connotations, feeling like a ray of sunshine. 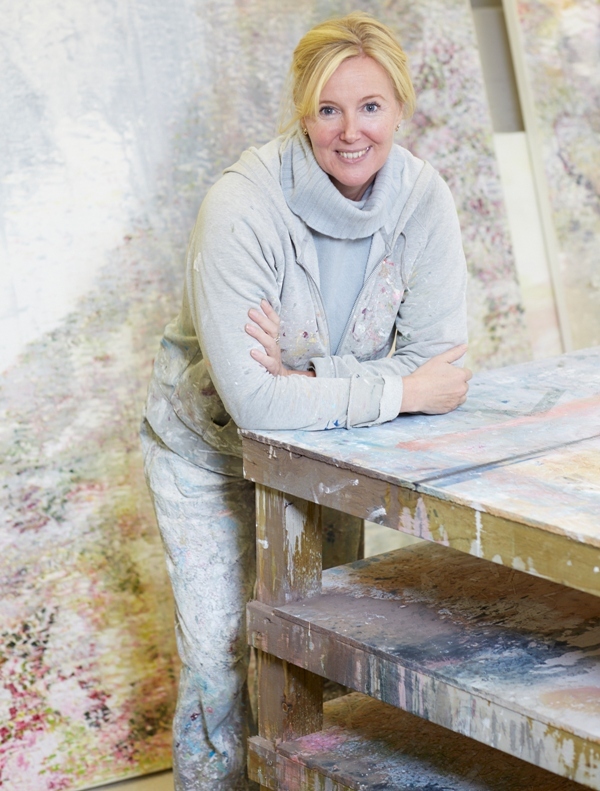 Her work has that ability to reach into your soul and leave a footprint that’s hard to shake off and after all my years of choosing and selecting artwork for clients, viewing shows and meeting artists, none have had such a profound impact on me’ – those were Davina’s words & I know that she is too experienced a professional to give such praise lightly. Surprised by a coincidence ( the world might be big but our connections bring it so much closer on a daily, basis ), I dashed across town to see the exhibition, only for the staff not to be there as on that day they were only open for appointment-only viewing. To cut a long story short, I managed to see Jessica’s paintings ( including her ‘signature’ lilies ), perfectly framed by sculptural interior and light flooding through floor-to-ceiling windows. I slowly walked around the exhibiting space, mesmerised by the masterful strokes and the effect that paintings had on me – I just couldn’t help but beam right back at them, feeling that Jessica’s complex & multi-layered work transformed gallery’s space into a place filled with serenity. Before long and after an introduction, Jessica and I started exchanging e-mails, with me hoping deep inside that she won’t find them too foolish, as at times the world of art can seem overwhelmingly unreachable or snobbish. Yet the more of Jessica’s e-mails dropped into my inbox, the more I fell under Jessica’s charm and warmth. It’s as if she was smiling at me through our exchanges, while giving me a personal tour of her work. In December I received an invitation to Loughran’s Gallery first birthday show called ‘ONE’ which was showcasing the talents of not just Jessica ( and some of her favourite pieces ) but also Marc Quinn and Damien Hurst. This was also an opportunity to see all six of Jessica’s paintings united under title ‘Passion’ together ( each dramatic in its own right but ultimately showing the range of emotions that Jessica herself has gone through, as the paintings developed – they have a very strong impact, almost pinning you to the ground ), as well as her ‘Adventure’ sculptures and the Wishing Tree, which came to life through her collaboration with her partner Karl Smith. When I arrived Neo Bankside, Pavillion A was heaving with activity and as I knew no one to start with, I just walked around, drinking in the atmosphere and the surroundings like young wine, before Davina dashed in and introduced me to Jessica in person. My impression to this day is of a beaming, beautiful blond woman, in a long cosy coat whose eyes sparkled with inner joy and contentment. There was something child and Tinkerbell-like about her innocent joy of being at the show, with her paintings hanging around us on concrete walls & sculptures standing proudly tall to attention, adding an extra layer of intense beauty to work. Looking at her and Karl I thought to myself that not often one sees two grown-up people so obviously in love and so in tune with each other. We talked about Jessica’s new book ‘Dancing with colour’, as well as the Wishing Tree that was lovingly carved by Karl ( he is a very talented design maker in his own right, working with wood, steel and precious metals. Have a look at the hand rails that he designs and creates, I have never seen anything like that ) – later I would tie the string around its trunk and make a wish, as did many men and women who came to see the exhibition. There were contagiously happy, buzzy vibes in the gallery space that night and the air sparkled with amusement and wonder, when one really couldn’t help but feel that the Christmas season ahead would be truly magical. Jessica lives and works in Lewes in East Sussex, with her studio positioned closely to her home. Even though her star is clearly on the ascendant, she is a gentle, softly-spoken and unassuming woman who seems somewhat genuinely surprised by her own success, which makes her even more endearing considering the reputation of the art world. As Davina, who knows Jessica much better than I do, says ‘her work is truly extraordinary and the pictures you see online don’t do it justice. Jessica works with oils and glazes that catch the light and are like the insides of a shell. Her paintings hint at modern-day impressionism, with Jessica clearly affected by nature and her environment’. So on this note, allow me to stop my rumblings and let you form your own opinion of Jessica Zoob and her work. GAP: Can I ask you about your childhood and your parents? Were your parents creative? Did you start painting as a child? Were you a dreamer? JZ: My mother is a textile artist, so my childhood home was full of looms, spinning wheels and dried flowers for natural dying of yarns and papers. My father is a poet. I was always happiest when I was making something or drawing or reading on the garden gate under an umbrella in the rain. I used to dream of all the extraordinary things I would make, of living in the countryside (I grew up in South London), costumes, hats, jewellery and ceramic sculptures and I also was passionate about my dancing, which I did almost everyday from the age of seven t0 sixteen. GAP: Who guided you at the beginning of your journey as painter? Do you think it was easier being creative then compared to how driven by success and results our society is now ? JZ: My biggest inspiration when I started to paint full-time in 2000 was my daughters and the freedom and joy they brought to my creativity. I think being an artist is a compulsion and is something separate from what else is happening in society. It has always been incredibly hard and incredibly exciting to be an artist, in whatever time or society you may find yourself. GAP: I wonder if you enjoyed being at school and what were your favourite subjects? What happened when you finished high school? JZ: I didn’t particularly enjoy school, I was not allowed to study art but had to do Latin instead. My real life as a teenager was spent studying dance. When I finished school, I went to CentralSchool of Art and then Nottingham University to study theatre design. GAP: How does the ‘life’ of each of your paintings begin? JZ: The paintings begin as visual murmuring in the back of my mind, once they start shouting at me I really need to get started! Lots of murmuring going on now, but still feel I need to recover from my mad summer a bit! GAP: Do you paint several paintings at the same time? JZ: Yes, I always paint a collection of works over a period of time, usually between 12 and 30 pieces which will grow and influence each other as the collection progresses. Am about to start a series of 12 large works, very excited. GAP: How did you take the leap to paint full-time? JZ: I started painting full-time in 2000, it was my millennium new years resolution! Call it a leap of faith! GAP? How do you allocate the time when you have the kids? Do you detach from family life when you work? JZ: I’m not sure that a mother ever completely detaches from family life but I am utterly focussed on my painting when I am working, and I dream about them when I am not! GAP: Is being an artist a lonely profession? JZ: I am very content to work alone, so I don’t find it lonely. Actually I am spending so much time collaborating with other practitioners and exhibiting my work that the time I get to spend alone is quite rare now! GAP: Are you part of the art community? Do you do shows like Frieze or Venice Biennale? JZ: I am not sure what you mean by ‘the’ art community but in a general sense I suppose I am making my own contribution to the ongoing contemporary scene. I have not shown my work at Frieze or in Venice. GAP: How long does one of your paintings take to complete and for how long can you paint at a stretch? Why did you choose oils and glosses for your work? Do you paint everyday? JZ: My paintings usually take about two years to complete, I think the longest was eight years though. I work in oils as I absolutely love the colours, I feel it is like using silks as opposed to nylon. I can’t paint everyday sadly, as I also deal with a lot of the admin involved with my work. I get out to my studio as often as I can though, it is my playground and I love it there. GAP: Your paintings sound like a labour of love, and it must be really hard to part from them when you invest so much of yourself and your talent in them….When did you hold your first exhibition? Were you nervous? JZ: I had my first exhibition in a pub in West London in the autumn of 2000. I remember we had absolutely torrential rain that night and yes I was horribly nervous! I always get horribly sick with nerves before a solo show and it never gets any easier! GAP: Was your success gradual or did it arrive like a tide? How did you choose which art dealer/gallery you wanted to represent you? JZ: I have been incredibly lucky as an artist and have been selling works steadily for many years now. The last couple of years have been particularly crazy though. I have also been very lucky in that I have been approached by dealers and sometimes I exhibit with them. GAP: Are you a sensitive soul? Do you ever become ‘attached’ to a painting and don’t ever sell it? JZ: I definitely get very attached to my paintings. I don’t consider them ready to sell, unless I don’t want to part with them. In other words, if I really want to keep a painting, then I know it is ready to be shown. I do sometimes keep my favourites, but there are a few which I have sold and would dearly love to have back ! GAP: Who, if anyone, has made a big impact on you as an artist? JZ: I have tried really hard to forge my own voice as an artist, so for many years I deliberately didn’t go and see other artists work, as I wanted to be sure I was following my own path. It is only in recent years that I have started to go to exhibitions again, which has been really exciting. I saw the Viennese Portraits at The National last year and it was absolutely magical. GAP: After your last solo exhibition, what’s next for you till the end of this year? JZ: I am excited about getting back out to my studio and starting work on my next collection. I will be quite busy with the launch of the cushions, wallcoverings and fabrics for Romo Black Edition and there are some other exciting projects in the pipeline. ( Note: since Jessica’s answer she has very successfully launched her Desire Collection for Romo Black Edition, which was recently presented in Paris & London ). On March, 19 Loughran Gallery is opening its new show, SPRUNG, in Chelsea where Jessica will be exhibiting her new Midnight Blue paintings alongside Tracy Emin, Damien Hirst, Dave White and Takashi Murakami, so if you get a chance until April 5th, drop by and see for yourself why I feel so enchanted by this incredibly gifted artist who has multi-faceted talents, showcasing her Desire for Romo Black Edition during London Design Week, while also getting ready for her solo show this year at her Annual Open Studio in Lewes at the end of this summer. What more can I add ? Well, my own collection of Jessica Zoob art has started with the most beautiful set of postcards, together with the DVD of a short film of Jessica at work in her studio. I am still mulling whether to keep them as they are or frame them and hang them on a brick wall, running alongside a wooden staircase. I also hope to buy some of her pillows and a print in Diasec mounting. After all, who wouldn’t want to have beautiful, zen-like art that makes one reflect and feel innately at peace, in the privacy of one’s home. And you know what else? Jessica’s exhilarating work makes you become a dreamer as you stand before her canvasses and absorb them like a child eager to know the world. You can purchase a variety of Jessica’s work through her beautifully curated website ( limited edition prints, iPad & iPhone cases, books, original miniatures, Romo Black edition cushions etc. ) or learn about Jessica and her work in more detail through her blog. A selection of Jessica’s prints & miniature paintings is sold via Not On The High Street and when that project was on the cusp of being launched, Jessica was childishly excited about it. What beautiful art!!! And an amazing write up Galina!